The Spanish came north from Mexico to occupy New Mexico at the end of the 16th century. They arrived at the Indian village of Ohkay Owingeh in 1598 declaring it the first Spanish Capitol of New Mexico and renaming it San Juan de Los Caballeros. They also brought to the region many European customs and most importantly the Catholic church. There was a great deal of cross fertilization and assimilation over the years which has only begun to be studied in recent times. One ceremony that has been adapted from the Spanish tradition is the Matachines Dance. It is performed in both Hispanic communities and Indian Villages throughout the Americas. 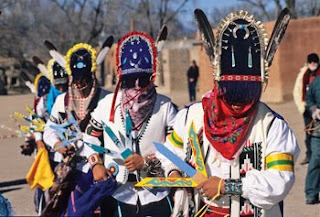 In Northern New Mexico it is danced around Christmas time and is more secular than religious in nature. We attended a Matachines Dance at Ohkay Owingeh on the day before Christmas. There is an old joke about Indian Time based on the fact that the Indians do not look at time as we do; it is merely an indication as to when an event may occur. We arrived for the dances at around 10:30 in the morning. An area in front of the two village churches had been cordoned off for the dance and there were a few Native Americans waiting as well. We saw the Anglo Parish Priest nearby and asked naively what time the dances would start to which he replied, “I don’t know, I have been waiting here since 8”! The dance varies from village to village and the story being told remained a bit of a mystery to us. At Ohkay Owingeh there were only 15 to 20 participants. The leader who wore an open crown represented Montezuma (c. 1398-1469). One can find varying spellings of his name, he was the fifth Aztec Emperor. Dancing nearby and sometimes interacting with him was his Mistress La Malinche. Here, however, she had been transformed into a little girl in a white party dress. Wandering around the outside of the group of dancers were two men with masks and whips. They were called abuelos or grandfathers and were clearly guardians who also assisted any dancers who might need ribbon straightening or bandana tightening. While Native American dances are usually accompanied by a drummer and a chanting chorus, here in front of the dancers we found a fiddler, a guitarist and a little boy with a drum who seldom played it. Also, up front was a child who represented a bull and every once in a while he would attack one of the grandfathers with his horns. Then we heard the drummer boy beating his drum intently as the bull started to attack Montezumah and we heard a shot. We had been wondering why there was a man with a rifle standing at the edge of the onlookers. The bull fell and was dragged off only to revive a short time later with a handwritten sign around his neck saying, “Bull for Sale”. Later he came back without the sign to fight again with the grandfathers. The dance took a little over an hour (extremely short, relative to the traditional Indian dance). Afterwards, the priest gave a blessing reciprocated by a thank you from one of the tribal elders. The priest then left and we thought that the dance was over but more people were arriving. Everyone was walking across the road to the pueblo’s plaza where traditional Indian festive and religious dances are held and the entire dance was started over again. To witness first hand the cultural amalgamation of the European and Native American traditions was another step in our education about the American Southwest.